As always we’ve celebrated Midsummer with my family in Svinninge. I’ve probably celebrated midsummer here more than half of my life. We used to go here when it was only a summer house (my parents moved here year-round in 2003) and since we moved back to Sweden we’ve been here every year. As usual we’ll stay the night as well. It was sunny all day today but VERY windy so I wasn’t able to be outside much as my joints has given me some issues today. For lunch we ate pickled herring which I’d prepared. We also ate the first new potato of the year. After lunch it was midsummer cake time! 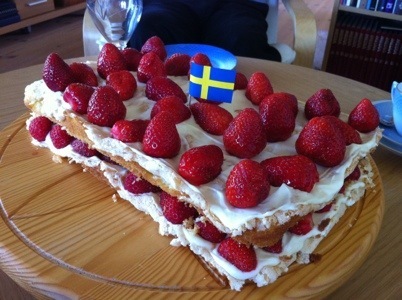 It’s my favorite summer cake and my mother has made it every midsummer as long as I can remember. Soooo delicious! The rest of the afternoon I spent inside in the sofa under a blanket. 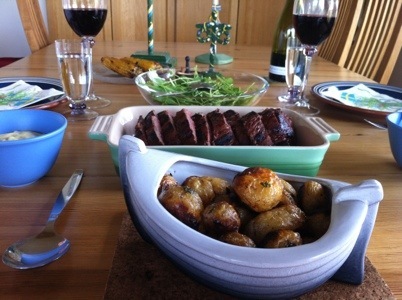 For dinner we grilled a beef steak and new potatoes. 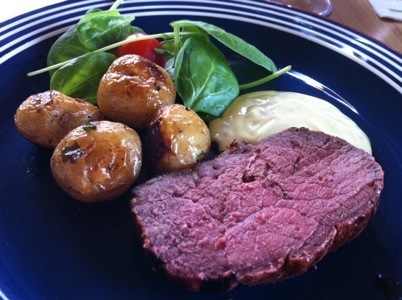 It was the first time we’ve tried grilling new potato and it turned out great. I plan on posting the recipe within a few days.